If you are under persistent, long-term stress, be aware that any decisions you make will tilt toward higher-risk options -- such as accepting a job that might be a mistake. New research from MIT neuroscientists finds that riskier decisions are made when there are impairments of a specific brain circuit. The good news is that in tests on mice, scientists were able to bring back normal thinking patterns by manipulating this circuit. The hope is that someday something similar could help people with depression, addiction, anxiety or poor decision-making. In the meantime, this is a something to be aware of when you're trying to make a decision about a new job or even a new work assignment and you've been under chronic stress. Scientists say that when you're faced with options that have both positive and negative elements, you're more likely to opt for the riskier choice because the stress is affecting your brain's decision-making. You may, for example, ignore the high cost of the job (long hours) and choose the high reward (high salary) instead of the job that will offer you less pay but give you more time off. Another cautionary note: Once the shift in thinking occurs, it can last for months. There has been plenty written about the havoc that stress causes on your body. It can lead to physical ailments such as high blood pressure and stomach problems, not to mention sleepless nights. It can hurt your relationships on the job and at home. Now with this research, there's something else to consider about stress since it might impair your decision making. While you're entering the sometimes frantic holiday season, thinking about whether it's time you took significant steps to reducing your stress, whether it's through exercise, taking up a fun hobby or even finding a therapist to talk about what's stressing you out. Your future career happiness may depend on it. Since he was a university student in the Netherlands, it has bothered Freek Vermeulen that newspapers are printed in the broadsheet format, which he contends is awkward and flimsy to read. When he became an assistant professor of strategic and international management at London Business School, he took the opportunity to question newspaper leaders about their format and discovered leaders didn’t really know why they used broadsheets – it had just always been done that way. Vermeulen then turned a couple of research assistants loose to dig deeper into the reasoning. They found that the broadsheets were born after the English government in 1712 began taxing newspaper companies based on the number of pages that were printed. While printing the larger pages made sense at the time, the practice continued even after the tax law was abolished. Vermeulen, now a full professor, says this is a great example of the trap many companies fall into – hanging onto things that don’t really make sense. It’s also why they fail to evolve and innovate. You know those picky and demanding customers who drive you nuts? Or, those employees who endlessly complain that things could be done better? Instead of running away from those you may consider annoying, it’s time to start listening to them, says Amanda Setili, a strategy consultant who has worked with Coca-Cola, Delta Air Lines and Home Depot. That’s because those who complain – whether employees or customers – are doing so because they have ideas about how things can be done better. It’s just those idea, she says, that may keep a company afloat in a rapidly changing marketplace. Unfortunately, many companies do exactly the opposite and tune out diverse opinions. They hunker down in their uncertainty, blocking out dissenting views and embracing the status quo as a way to ride out the unknown. Canadian astronaut Chris Hadfield says that the first nine minutes of a space mission account for at least 50% of a mission’s risk, which is why the crew spends so much time asking themselves how they will react if there’s an inadvertent engine shutdown or a loss of staging rockets. “A nice way to keep reminding yourself is: ‘What’s the next thing that’s going to kill me?’” he says. Or course, most company teams don’t face such dangers, but that willingness to consider what risks are around the corner and how to deal with them is the right mindset for innovating, says Luis Perez-Breva, a research scientist at MIT’s School of Engineering and originator and lead instructor of the MIT Innovation Teams Program. “What this illustrates is that despite feeling some panic when thinking about the risks, these astronauts set that aside and continue on with getting prepared for anything they might be able to predict,” Perez-Breva says. He explains that being “productivity wrong” – such as the astronauts trying to determine what can go wrong – can benefit companies. Instead of trying to find only one best answer, they can think about the obstacles that they can work around – and figuring out how ideas can be wrong can be a great learning tool. He says too many companies fail because they simply haven’t thought about the potential pitfalls of a product or service. The holiday season is beginning to ramp up, and your thoughts may be consumed by Black Friday deals or how to make your nana's pecan pie. Amidst all these celebrations, however, it's time to also do a little career celebration. That's right -- it's time to give yourself the gift of new connections, better communications and making nice with teammates. It's no secret that work often can be stressful. But if you do a few things now for your career as you are wrapping gifts and plotting leftover casseroles, you will find that it is a gift that gives for a long time. For example, while you're reaching out to family and friends this holiday season, why not also reach out to new connections in your company or your industry? How about a "happy-holidays-and-I'd like- to-connect" message via LinkedIn? Or, send a friendly Facebook message to someone you met at a conference, wishing them a joyful Thanksgiving and a "let's-set-up-a-time-to-talk" message? The point is, you will find people in a much more receptive mood during this celebration season, so why not see it as an opportunity to network? Demonstrate your emotional intelligence. More companies are focusing on emotional intelligence when making new hires or offering promotions. While your hard skills may be just fine (Ruby on Rails is a breeze for you), others may see you as, ahem, less than friendly. So, find a calendar of a boss's favorite baseball team and offer it to him so he can feel cheered in 2018 every time he looks at it. Or, reach out to a teammate who has been struggling to learn a new program and offer to pick her up a cup of tea or coffee the next time you're going on a snack run. Bring it back with a small "hang in there" note to let her know you're cheering her on. Listen. 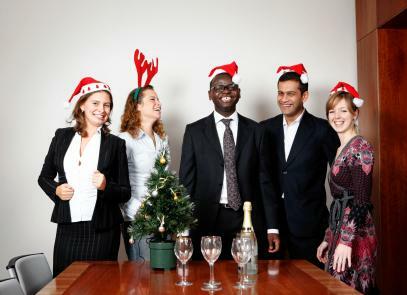 The holiday season offers numerous opportunities for office potlucks, gift exchanges or parties. This is a great opportunity to listen to people in a more relaxed atmosphere. They'll often share things that bring them joy: family, friends or hobbies. This helps you get to know them better and develop stronger, more personal ties that can also boost your professional bond. Share. Just as your colleagues or bosses are willing to chat with you more about their lives, you should be willing to do the same. You don't have to overshare with the results of your latest colonoscopy, but you can talk about hobbies you enjoy, travels that have been exciting or what you like to binge watch on Netflix. Sharing a common love of "Stranger Things" can be the key, for example, that unlocks the door to a better relationship with a prickly colleague or a standoffish boss. While the holiday season can be a bit crazy, take some time this week to think about ways you can gift yourself with career happiness in the coming year -- and enjoy doing it while eating some pumpkin pie! Companies often are protective of the innovation process, taking steps to protect their ideas from “outsiders” and trying to ensure competitors don’t get even a whiff of what they’re thinking. The problem is that such a mentality ends up shutting out so many people, even from inside the organization, that the ideas aren’t as innovative or as viable as they would be if more people were included. Recent research backs up the idea that innovation needs to be open to more sources of inspiration, and innovation experts like Nilofer Merchant argue that companies are missing golden opportunities when they don’t invite all employees to suggest creative products or processes. If you ever lack for conversational openings at a networking event, you can always ask "So, how do you feel about meetings?" The other person is likely to respond with at least several minutes worth of opinion, from "there are too damn many" to "meetings are slowly killing me." There have been many ideas over the years on how to either shorten meetings or eliminate them. There have been standing or walking meetings, which are supposed to a)shorten meetings because feet get tired from standing or walking and b)help you at least get some health benefits from the event you believe is slowly killing you. There is also the idea of making everyone put their cellphones in the middle of the table, with the idea this will keep participants from being distracted by their phones and lead to a more efficient meeting. I've interviewed a number of experts over the years, and they all have various ideas about how to make meetings better. Most of them suggest it's critical that there be an agenda and only essential people be included in the sessions. But after that, the opinions sort of diverge. Some leaders put a time limit on meetings, and you better learn to say your ideas in a fast and concise way or you risk being cut off. There is also the opinion that you spend the first 10 minutes shooting the breeze, which gives the latecomers a chance to show up and actually makes things more efficient. I don't profess to know the answer. Personally, I don't like meetings and I often hate them. But I know that they are necessary to getting things done, and without them I wouldn't have a chance to sit down with colleagues and focus on them face-to-face. But is there a balance? Should some meetings be deemed as "action" meetings and require concise conversations that stick strictly to a specific agenda? If that's the case, then should meetings that are more free-wheeling be called "lazy-Susan" meetings where the conversation spins around the room as needed? You know what? I think we need to call a meeting to discuss this. When you decide to change jobs, you may have certain criteria in mind about what jobs you will take and the ones you will dismiss. Some of your criteria may be based on salary, location, company culture or perks. One area that often is overlooked is the job title. I think part of that is because people have gotten into some wacky titles such as "ninja salesperson." Or, they think the title doesn't really matter -- they just want a better salary and more vacation time. But a recent study by Comparably shows you need to pay more attention to the title that comes with the new job. Specifically, in a look at tech jobs, it shows that "sales representative" and "sales engineer" garner bigger jumps in salary over time. The jump in salary over a decade can be as high as 55.9% -- that is a much bigger increase than the 3% annual bump you might receive in other jobs. While it's true that tech may have bigger jumps in salary than some other jobs, it's also a good reminder that in any industry you need to pay attention to job titles. For example, if you're doing management work, then "manager" should be in the title and not just something like "team visionary." When you go looking for another job someday, another employer may not have a clue what a "team visionary" is and conclude you're not ready for an upper management job. While you may explain that you really were a manager, that employer may have doubts and move onto someone else. The same thing should be top of mind when you're given promotions within your company. Make a case that you want a job title that matches your job duties. If not, then the company may be able to keep your salary lower than you deserve and prevent you from future career opportunities. Take a look at your resume this week and try to determine if your job titles show a steady progression in the right direction. If not, it's time to rethink how your current job title can be improved -- and the next job title you want to reach.